You have seen the statistics and let’s face it you don’t need statistics to validate what you already know. A study conducted by the National Multi-Housing Council (NMHC) and the National Apartment Association (NAA) found an 18 to 39 percent reduction in water consumption in submetered dwellings compared to units that include water expenses in their rent. 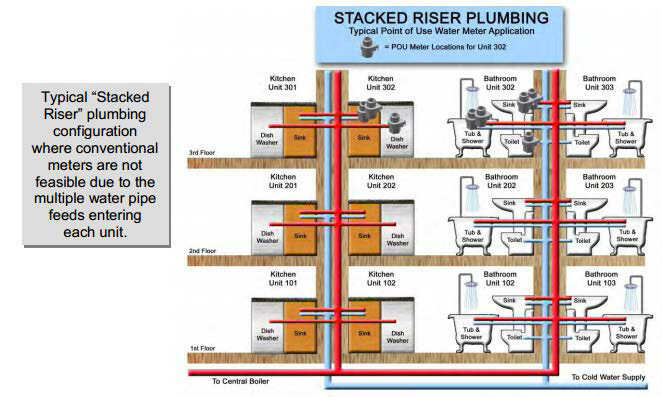 The reality is for many portfolios with older properties, submetering is cost prohibitive due to older or stacked riser plumbing. You want to recover your property’s water expenses but due to regulatory restrictions – no individual consumption measurement, no recovery – you will find yourself out of compliance and in hot water with your regulatory commissions. Water Conservation strategies such as modifying resident usage through conservation tips and rebuilding your existing water fixtures with more efficient models reduce your water expenses but what can you do if you want to bill back for actual water consumed? Option #1: Do nothing and continue to hope somewhat will invent a new submeter for old plumbing. Option #2: Re-pipe your entire building which is intrusive to residents and very expensive. Option #3 – Invest in your assets by installing Point of Use Meters and start recovering your utility expenses. Massachusetts properties spend an average of $850-$1,000 per unit/annually on water expenses. Installing MPUs can yield a payback in less than 24 months. The i-meter from MeterLogix allows for point of use metering while maintaining aesthetics. The meters are small and easy to install out of view. A custom designed interface card sums up input from up to eight i-meters. An MPU or “point of use” water submeter can be used in any building regardless of their plumbing style. The difference between an MPU and a traditional submeter is that an MPU is installed on every water point in the unit (toilet, dishwasher, bathtub, shower, etc). MPU meters are permitted in states such as Massachusetts and Connecticut where submetering laws are stricter. The rising cost associated with water is now in line with electricity and gas consumption. The result is a heavier burden on a property’s budget and more importantly profitability. Today, more and more portfolios are making the decision to bill back water consumption which results in a healthier NOI and environment. This entry was posted in Uncategorized on October 7, 2014 by Minol USA.